Measles outbreaks in New York and Washington state have public health officials scrambling to contain a disease that was eliminated in the USA nearly two decades ago. Washington state declared a public emergency in the wake of an outbreak in Clark County that has infected at least 53 people, mostly children. Four cases have been confirmed in neighboring Multnomah County, Oregon. Another case has been identified in King County, which includes Seattle. Clark County public health officials have long feared a measles outbreak could spread rapidly given the county's cluster of non-vaccinated children. Nearly one in four Clark County kindergarten students during the 2017-18 school year did not get all their immunizations, according to data from the Washington Department of Health. At three schools in the county, more than 40 percent of kindergartners did not receive all recommended shots before starting school. "When you have large numbers of unimmunized people and you introduce measles into that population, it's like putting a lighted match into a can of gasoline," said Alan Melnick, Clark County's public health director. "It will just spread pretty quickly." In general, Melnick said, public health departments want to immunize up to 95 percent of the population against measles to create herd immunity. Such widespread vaccination protects against the highly contagious virus, which can be spread through the air. It also protects people who are unable to get vaccinated because they have other medical conditions. State laws generally require parents of school-age children to show proof of immunization or claim an exemption before beginning school. All but three states – California, Mississippi and West Virginia – allow parents to reject vaccinations for non-medical reasons, such as religious or personal beliefs, according to the National Conference of State Legislatures. The risk is when there are large numbers of children in a single setting, such as a school or a church, who are not vaccinated. "You need a high enough vaccination rate to prevent measles from spreading," Melnick said. The Centers for Disease Control and Prevention reported 79 cases of measles in the USA. Beyond Washington and Oregon, cases have been reported in California, Colorado, Connecticut, Georgia, Illinois, New Jersey, New York and Texas. The New York outbreak is the state's largest in decades, said Jill Montag, a New York State Department of Health spokeswoman. More than 200 cases have been reported in Rockland and Orange Counties and four Brooklyn neighborhoods since October. The majority of those cases were identified last year, but some new cases continue to trickle in. There have been two dozen in Rockland and Orange Counties since Jan. 1. Two Brooklyn neighborhoods reported three cases in the past week. The Brooklyn cases are concentrated in the Orthodox Jewish community. The outbreak began when a child who was not vaccinated was infected on a visit to Israel. Israel is itself experiencing a large outbreak, according to the New York City Department of Health. New York health officials have excluded thousands of unvaccinated children from 29 schools and daycare centers where other children might have been exposed to the virus. They have also launched vaccination drives. "We will continue our aggressive, multi-pronged response, until it is clear the outbreak has been contained," Montag said. There has been a surge of parents seeking vaccines for their children in Clark and Multnomah Counties. Paul Offit, director of the vaccine education center at Children's Hospital of Philadelphia, said the refusal of parents to vaccinate has allowed the highly contagious disease to return. In 2015, an overseas traveler infected with measles visited Disneyland, triggering an outbreak that spread to several states and infected 147 individuals. In 2017, an outbreak among the Somali-American community in Minnesota infected 75 people, according to the CDC. 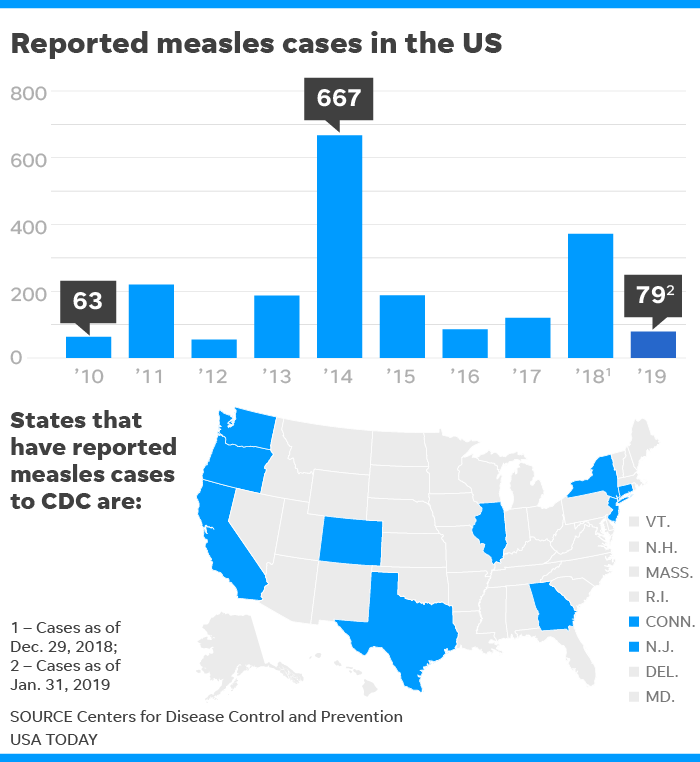 "People aren’t scared about measles," Offit said. "It is not just that we’ve largely eliminated these diseases. We’ve eliminated the memory of these diseases. People don’t realize how sick it can make you." April 13, 2019, 1:18 p.m.